He claimed the decision was taken about a month ago. Hamzah said that their decision to leave the party had to do with UMNO President Dr Ahmad Zahid Hamidi's leadership issue and that he should step down. 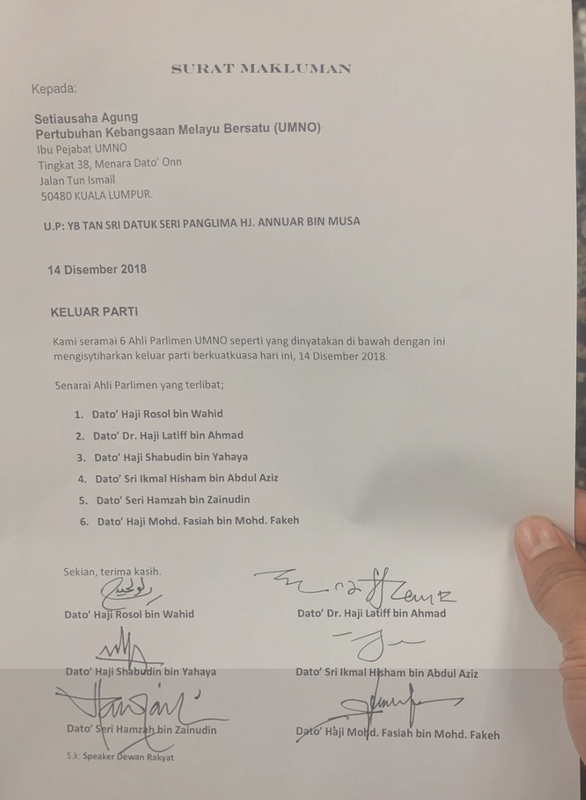 "This also has to do with the court case that Zahid is facing, which has caused members and the people, especially Malays, to lose faith in his ability to lead UMNO to face the next general election," Hamzah was reported as saying on behalf of the group. "This group sincerely want to ensure that the government is stable and ensure that no one uses Parliament to dethrone the PM because we are hearing suggestions. "If the political situation is not stable, it would cause problems to the people. "That is why we want stability and we support the PM to lead. This is all in the nation and the people's interest," Malaysiakini reported the former Cabinet Minister as saying. This photo of a meeting of Tun Dr Mahathir with UMNO leaders, including Hamzah, UMNO deputy president Mohamad Hassan, former UMNO secretary-general Tengku Adnan Tengku Mansor, Arau MP Shahidan Kassim and Tanjung Karang MP Noh Omar went viral this week. The photo was, however, taken during their meeting in October. According to Hamzah, he and his former party colleagues colluded to ensure that Zahid was in the dark. He was reported as saying that the "boss" was unaware. "I chose to write an open letter because we have the responsibility to be open with each other." The victim's parents hope to extradite him and have him charged in China with the death penalty.